Ginger invited me to tell you how I came up with the story idea for one of my books. I write books set in Texas, usually with a rancher as the hero. Since I live in North Central Texas amid cutting horse and cattle ranches and I see cowboys on a daily basis, writing books set in the west appeals to my sense of history as well as my location. On a trip home to the Dallas/Fort Worth Metroplex from a visit in our hometown of Lubbock in West Texas, we were in a hard downpour as we drove from Post toward Snyder. I remembered a high school teacher’s story of seeing a watertight Volkswagon swept off the road up onto the high railroad bed. The family inside the VW emerged safely, but their car eventually floated away on the swiftly moving floodwater. My teacher’s old leaky Renault was safe, so he could help the flood victims. Every event sends an author’s mind playing “what if” for story ideas. That day, instead of worrying about our car being swept away (my husband is an excellent driver and we were in a heavy car), I started playing around with the flood and what if a woman were swept away and had to walk toward safety on the rails and what if a rancher saw her... You can see how this story emerged to become BE MY GUEST. I love the topography just below the Caprock area. My favorite is around Benjamin and Guthrie with the red clay ravines and the 6666 Ranch. But I also love the land between Snyder and Post where the Caprock is visible and the highway passes over little creeks and a fork of the Brazos River. Since I have trouble controlling my weight (or trying to), I wanted a heroine who could eat all she wanted without gaining. Not all fiction, because my mom could and my brother can. Sigh. I always wished I had looked like a young Maureen O’Hara with thick auburn hair. My grandmother and uncle had red hair, but I started blonde which turned mousy brown and is now...ahem...enhanced by lovely blonde highlights. ;-) You see how I created my heroine, Aurora O’Shaughnessy. The hero, Will Harrison, is a rancher. Easy peasy. I know a lot of them and an image popped into my head. But I needed to make helping Aurora more difficult, so I broke his leg. No, not me personally, but I created a fall which left him with his leg in a full cast. And what is it about a cast? You can’t get it wet! Yet he had to get Aurora out of the floodwater and to safety. Aurora Kathleen O’Shaunessy comes by her flaming auburn hair naturally, and this independent city woman has an inner fire to match. Nothing stops Aurora--that is, nothing short of a Texas flash flood. This super-organized businesswoman might be running from the past, but she’s using this journey to stop and smell the roses--rather the spring flowers in bloom across the Texas prairie. A brush with two rough men doesn’t faze her. But a handsome rancher with a precocious daughter makes her rethink her plans. Rancher Will Harrison rescues her from the raging waters and she’s his guest for the next thirty-six hours. That’s long enough for Will to fall head over heels in major attraction, and he has a hunch she might feel the same. He has a plan to keep her around until he convinces her to move out of the fast land and in to his life forever. He plans to ask her to marry him at his birthday celebration. First, he has to save her from two rough kidnappers who have other plans for Aurora. The clock on the dashboard displayed one o'clock when Aurora found herself free to concentrate on lunch in Snyder. Clouds gathered and rumbled with thunder over the West Texas town. Aurora's empty stomach rumbled with them. After a hazardous morning, fatigue overshadowed her usually cheerful nature. She passed by the fast food places before she spotted the family restaurant recommended to her by the Texas State Trooper a few minutes ago. Seated in the corner booth, Aurora ordered a hamburger, French fries, and a large Dr Pepper. While she waited for her food, she reviewed the items listed under the town of Snyder in her Texas guidebook. Suddenly, she sensed someone standing beside her booth. As she looked up--and up--a huge cowboy with most of his left leg in a cast leaned his crutches against the side of the booth. He slid onto the seat beside her, which pinned her in the booth with him. Aurora scooted to the right as far as possible. "Hey, who do you think you are? This is my booth, and no one invited you to share it with me!" "Your car's sitting in my parking space, so I'll sit in your booth," he said calmly as he removed his Stetson and ran his fingers through sandy brown hair. He turned in his seat to hang the hat on the hook at the end of the booth by his crutches. Aurora blushed when she realized this must be the man whose parking space she mischievously stole. Oh no, how terrible. He must have had to park a long way from the door and hobble in on those crutches. How embarrassing. The one time in her life she acted rudely, her victim turned out to be a man handicapped by a leg cast and crutches. Still, he had his nerve sitting beside her without so much as a "may I." Her chin came up defensively. "Okay, I apologize. If you used one of those disability placards on your rear view mirror, people would know you have a problem." "Lady, my problem is that you stole my parking space," Will Harrison said coolly. He lifted his left leg so that the cast-encased foot rested on the seat facing them, then swiveled to gaze at her. Aurora smelled the cowboy's after-shave mixed with the clean scent of his breath when he turned his face toward her. His stone gray eyes met hers. She saw anger drain from his eyes, replaced by stunned amazement. He leaned toward her. Her awakened senses rocketed into response. Each thread on the sleeve of his blue chambray shirt seared where it touched her arm. For a moment Aurora had the astonishing thought that this cowboy might lean further forward and kiss her right here in public. Equally astonishing, but fleeting, came the thought that she wouldn't mind a kiss from this man. Her tongue flicked across her lips and she gave herself a mental shake, unable to turn away from his mesmerizing gaze. Her heart quelled the voice of reason within her mind. Aurora’s her stomach somersaulted from butterflies to flip-flops as she stared into the cowboy's wide gray eyes. She broke his gaze and peered at her folded hands a second before she threw them up in capitulation. "Okay, Okay. I just don't know what came over me. I know you saw the parking space first, but I'm on Bubba-overload. Look, it's a long story, but it's been a real killer morning. Once again, I apologize and plead temporary insanity" She placed her hands palms down on the table. His gaze raked over her, and one eyebrow elevated. "Well, well. I'm almost convinced there's remorse here. Almost--but not quite. Would you like to explain to me what 'Bubba-overload' is and what it has to do with me?" The man peered at her steadily, his voice polite but firm when he spoke. "No, ma'am, we can't drop it. I think I deserve an explanation after that 'Bubba' line. It sounded very much like an insult to me." This man obviously had his hackles up and wanted a full explanation. After her morning's adventures, she found herself impatient with this cowboy, even though her mind recognized his request sounded reasonable. Finally, Aurora swiveled at her waist to face him as much as the limited space allowed. "Oh, well, if you insist. You wore that western hat and were in a pickup truck. At a glance, you looked like the typical red-necked Bubba. All you lacked was a big wad of tobacco bulging in your cheek." She raised her hand and shook a finger at the man as if he were a delinquent school boy. "Listen, I've had my fill, and then some, with you guys. You follow me, whistle at me, lean out a truck window to sing to me, shout, or wave to me. I even receive various very rude gestures and get mooned. Believe it or not, I do nothing either to initiate or encourage any of this behavior." "Oh, I know, I acted brashly with you outside just now. Let me assure you, that's entirely unlike me. In fact, it's truly a first. I've never, ever done anything like that before." She shook her head in wonder. "I don't know what came over me. As I said, it must have been temporary insanity due to Bubba-overload." She pinched the fabric on the leg of the neatly creased blue denim jeans she wore. "Look at me. My jeans aren't skin-tight. They’re not painted on me." With a tug at the hem of her hunter-green knit top, she added, "My shirt isn't too tight, it has three-quarter sleeves, and the neck isn't low or revealing." Aurora moved her knees and elevated a foot to display canvas shoes. "I'm wearing my little Keds, not flashy pumps with stiletto heels. All in all, I think I'm dressed very sedately and not at all in a provocative way." She forced herself to concentrate on her defense. "Um, I just drive along in my little blue Ford Mustang, enjoying the scenery and minding my own business. I do nothing to call attention to myself. I even try to be a good sport about the immature behavior some guys display." She took a deep breath. "I try to take it all in stride and just keep on schedule but"--Aurora slammed her hands against the top of the table--"this morning, two very frightening Bubbas tried to run me off the highway and hijack me or my car." His eyes widened and his mouth gaped, but she continued, "I'm only here because a State Trooper happened by in time to interrupt my abduction. Frankly, that scared the life out of me. The longer I thought about it, though, the angrier I became. By the time I got to this restaurant, I had completely lost my cool." She waved her hands in a fluttery motion. "When I saw you in a truck the same color as the one that ran me off the road...well...I guess I just went bananas, berserk, crazy. That's why I'm pleading temporary insanity." Aurora leaned back and crossed her arms in front of her. The waitress flashed what she probably thought of as her most seductive smile at the man. In a low, honeyed voice, she asked, "Anything else today, Will?" He seemed unaware of the invitation in her voice or the hopeful sparkle in her eyes. "Not right now, Norma Sue, thanks. Go ahead and leave the check now and save yourself time." Aurora gazed over he shoulder at the departing waitress. "How on earth did she know what to bring you? When did you give her your order?" Thanks to Ginger for letting me be on her blog. Thanks to you, readers, for stopping by. Happy trails. The Much Ado series and many of my other western historical romances are set in the Silver City area of Idaho, in Owyhee County, a large county in southwest Idaho with area about the same as New Jersey, but with one person per square mile. The county was considerably larger in the 1880s, when my stories are set. This remote county was a wild and wooly area of the West. 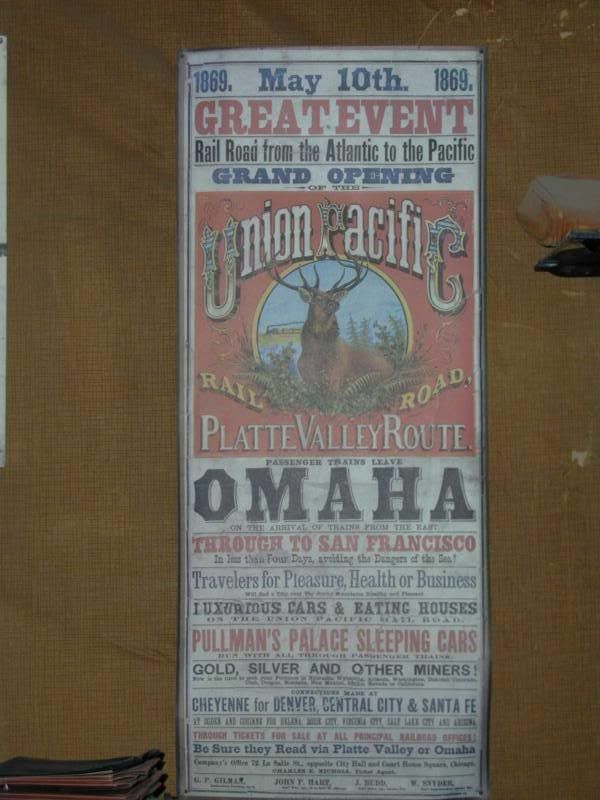 The gold and silver strike sent prospectors, gamblers, painted ladies, merchants, Chinese miners and merchants, bankers, and newspapermen to Ruby City. Problem is, the creek liked to flood there so the residents packed up the town, buildings and all and moved them to the Silver City site, where it still stands. 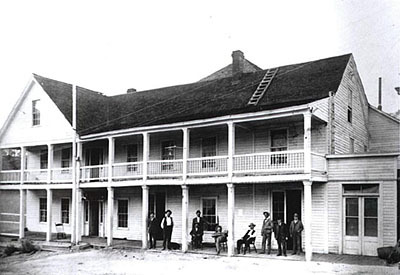 During its "heydays", Silver City had about a dozen streets, seventy-five businesses, three hundred homes, a population of around 2,500, twelve ore-processing mills, and was the Owyhee County seat from 1866 to 1934. Some of the largest stage lines in the West operated in the area, and Silver City had the first telegraph and the first daily newspaper in the territory in 1874. Telephones were in use here at least by 1880, and the town was "electrified" in the 1890's. So let's take a tour. On the right is the sign that tells you how to get there. I'd advise not to miss the sign. Oh, wait, there's only one road. I'd advise you to stay on that road. If you get lost, you have to pay Owhyee County to hunt for you. They had to implement this because so many city people got themselves into fixes they couldn't get themselves out of. Costs mounted and the budget just didn't have room for people's errors in judgment. These pictures are all taken by my daughter, Mercedes Christesen. Special thanks to her husband, Rodney, for using his day off to chase after pictures for his mother-in-law. Yes, you get points for that. Here's the Drug Store. 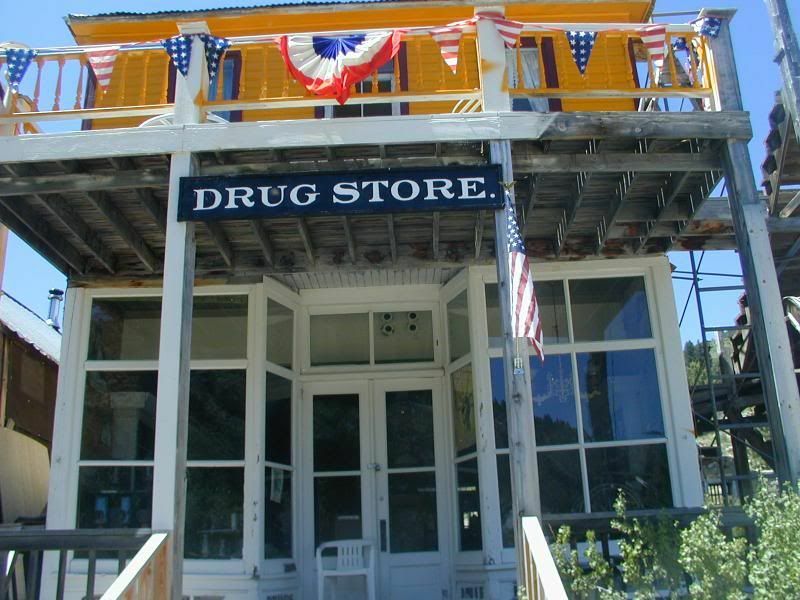 She wasn't able to get any history on it, but it was either called the Knapp Drug Store or the Model Pharmacy. Or maybe it was one and then the other. I think it's just called the Drug Store now, and not open for business anymore. It's currently a residence, as are so many former commercial buildings. There's an open house the weekend after Labor Day every year. I've been there--really interesting, and I urge you to go if at all possible. Make sure your car has decent ground clearance, though, and don't get too worried about the one-lane road (meaning room for only one car) because seldom does a vehicle come from the other direction. And well, if that happens, someone will have to back up for a mile or two. It's all fun. To the right is the Silver Slipper Saloon. This is a 20th Century saloon, open from 1918 to the early 1940s but it still looks cool so I included it. Silver City had many, many saloons and of course also had cribs and a street called Virgin Alley where ladies of ill-repute plied their trade. 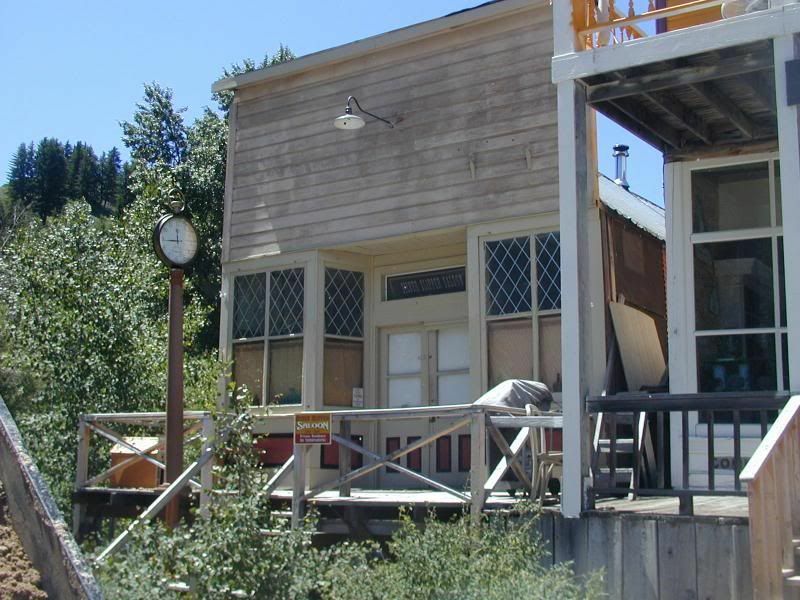 On Ghosttowns.com, you can see an older photo of this saloon and the drug store above. FEMALE PUGLISTS One evening this week be observed two frail females in the vicinity of Catalow's stable, engaged in commintting assault and battery upon each other. For some time the fur flew in all directions. They finally sank down in the snow through sheer exhaustion. Jealousy was the cause of the muss. Houses at its peak, 400: now, 67. Businesses at its peak, 125: now, 2. Working mines at its peak, 250: now, 1. This informaton comes from a sign on the menu at the Idaho Hotel. 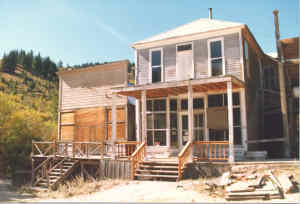 The building was constructed in Ruby City and moved to Idaho City in 1866. 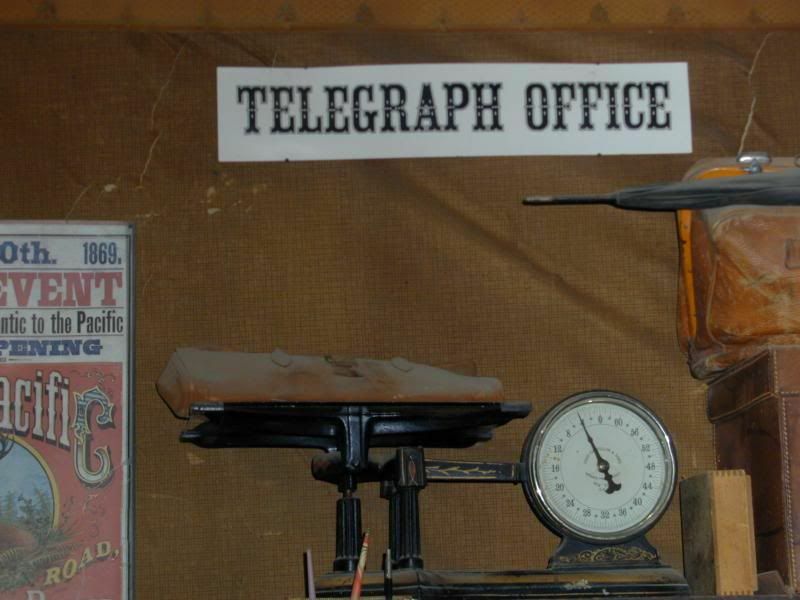 Even though Silver City had telephone service by 1880, the telegraph business thrived for longer distances. In Less than Four Days, avoiding the Dangers of the Sea! Life was hard in the Old West, especially when you're a couple hundred miles off the beaten path, at over 6,000 feet in elevation. But this wasn't empty country. A long-standing population of Native Americans from the Bannock and Paiutes were not all that happy about Europeans coming in and ruining their livelihood and cultures. 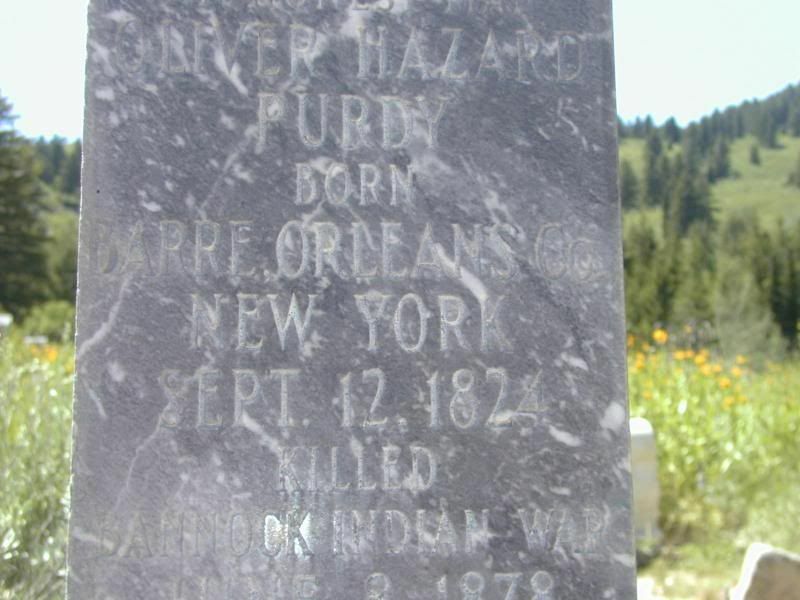 The next photo is the gravestone of Oliver Hazard Purdy, born September 12, 1824, and killed during the Bannock Indian War in 1879. Sometimes bad things happen but instead of dying, the perpetrators were put in jail. It looks as if this jail wouldn't be too secure these days, but it was formidible in its time. For more cool photos and accompanying descriptions, I highly recommend EdnaPurviance.org and GhostTowns.com. You can see the school and the church, too, where services are still held. The Masonic Lodge is still in good condition and is in use as well. I'll leave you with the coolest hotel ever. I mean EVER. This is the Idaho Hotel that I talked about above (menu board trivia). Yes, you can still stay there--they have 13 rooms in service (and I've even heard that it's haunted!). 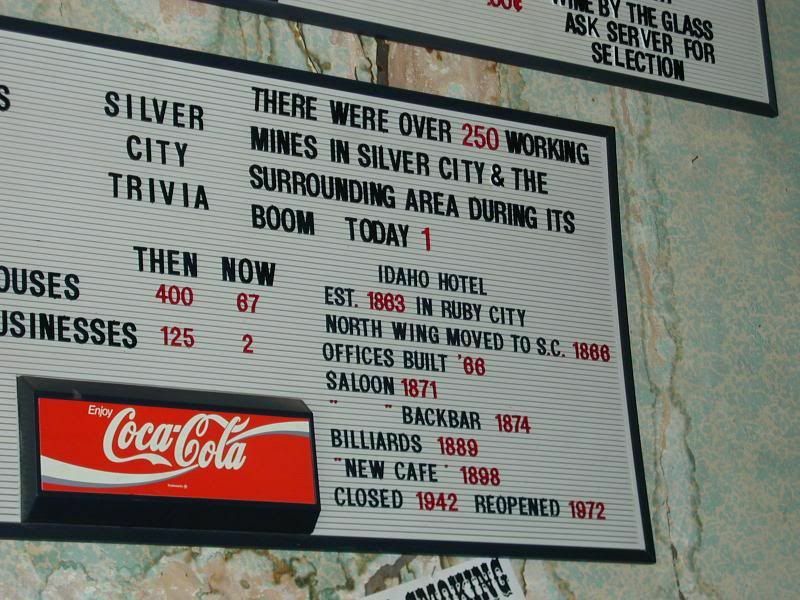 Go to the hotel's website for more cool history about Silver City. The Much Ado series takes place in Owyhee County, and most books are set in or near Silver City because it was the county seat, the largest city in the county (maybe in the territory), and was the hub of activity for a couple decades. 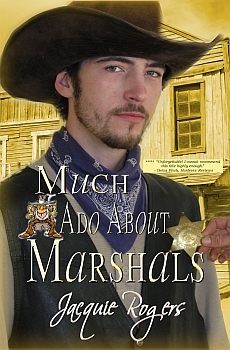 Much Ado About Marshals takes place in Oreana, Idaho Territory, but the pre-story takes place right here in Silver City. Stay tuned because another book in the Much Ado series, Much Ado About Madams (February 2012), is be set near Silver, in Dickshooter, Owyhee County, Idaho Territory. 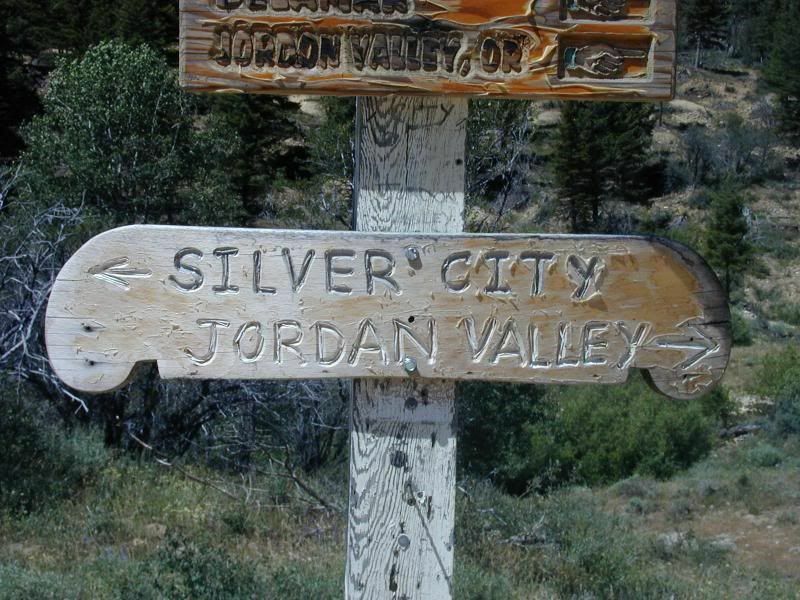 No, I didn't make that name up, but I did move it closer to Silver City to suit the story purposes. The third Much Ado book (June 2012) is set in Henderson Flats (modern day Marsing) and the fourth book, still in the planning stages, will be set in Silver City proper. Several stories on my backlist are set there, too. Owyhee County has a rich history and it's fun to share with others. Would you like to give Much Ado About Marshals a try? One commenter wins a smashwords coupon for a free copy. Be sure to include your email address in the comment. Drawing will be held 19pm Pacific Time, January 31. Good luck! Some people may not figure my newest release, Logger in Petticoats, to be a western because it deals with logging. But logging, once the railroads connected the country, became a booming business in the west. All the majestic forests in Oregon and Washington made the early entrepreneur drool knowing they could move the logs and lumber great distances to communities that were growing but had a lack of trees. Hank Halsey, the hero in Logger in Petticoats, had been eyeing the thick, tall pines on his family’s mountain since he was boy. But helping with the family mine and then taking care of things as each of his other brothers married, he felt obligated to do his duty. By the winter of 1891 he decided it was time to strike out on his own-harvesting the trees on their land. Knowing very little about logging he hires a family run operation and begins learning what it takes to fall a tree properly and get it moved to the stockpile at camp. A camp of sixty men needs lots of good food to keep them doing a hard day’s work. I added a mother/daughter cooking operation to the mix but the daughter would rather be out swinging an axe than stirring a pot of stew. Here is the blurb for Logger in Petticoats the fifth book of the Halsey brother series. Hank Halsey believes he’s found the perfect logging crew—complete with cooks—until he discovers Kelda Neilson would rather swing an axe than flip eggs. As he sets out to prove women belong in the kitchen, he’s the one in danger of getting burned. Strong and stubborn, Kelda Nielsen grew up falling trees and resents any man who believes she’s not capable, until Hank. He treats her like a lady and has her questioning what that means. Kelda already stood by the door, a man’s black wool coat buttoned to her neck and a wool scarf wrapped around her head. Her flushed cheeks shone in the lantern light. Her gaze met his solid and unflappable. “I don’t know what you’re worrying about. No man is going to think of Kelda in the way you’re talking.” The door hadn’t fully closed when Dag’s voice cleared the threshold. Kelda’s shoulders drooped proving she’d heard her brother’s comment. She walked around the corner of the cookhouse to a fallen log at the backside of the building. Hank wanted to catch up to her and wrap an arm around her shoulders. She was a fine woman. Any man would be dang lucky to have her for a wife. He stood in front of her as she sat on the log, her face pointed toward the men’s logging boots on her feet. “Ooooo!” Her hands ripped from his grasp and rammed him in the chest. He started tipping backwards and grabbed the first thing in reach—Kelda’s arms. He fell back into the snow dragging Kelda on top of him. The surprise in her eyes quickly turned to interest as she gazed down into his face. Her body sprawled across Hank, pressing him into the snow. Even with the heavy clothing, her curves were evident as her relaxed body molded over his. He held her head in his hands. Inch by inch, Hank drew her lips closer, wondering if the heat and passion he’d witnessed in her eyes would be in her kiss. Howdy, as they say in the old west. Today, I'm bringing up the rear on the Amazing Author's Event. My job, because I coordinated this wonderful event, is to provide you with the links to the posts of the last several days, and give you a question you can answer by having read or returning to read the information offered by said authors. I course, you can't think I'm going to not take the opportunity to promote one of my own books here...I have a prize to offer too, and it's a free copy of Odessa, published by Eternal Press. The wagon carrying Odessa Clay and her father overturns, killing him. Alone and scared in the middle of the desert, she faces finding her way to Phoenix and Aunt Susan. Food and water run out, and Odessa is near death when Zach Johnson finds her. Squinting up into his tanned and handsome face, Dessie believes she’s died and gone to heaven. Would-be-outlaw, Zach Johnson finds an unconscious woman alone in the middle of nowhere. Where did she come from? First glance: she appears young, but the curves beneath the dusty gingham say otherwise. He didn’t plan to become someone’s hero, but how can he leave her stranded? If you want to read a sample, Amazon is very generous in its offerings. Of course, you might be my lucky winner. Before we get to the questions, let me explain how this works. Most of our authors today are donating a free ebook. If you'd like to participate in the contest to win, it's easy, smeasy, lemon squeezy. Just draw on your memory if you've been following the tour, or use the direct links to go back to each site, then combine all your answers in one email and send to me here. What is Nate's real name? What is the setting for Historical romance novel Red Bird's Song? How long has Meghan been gone? 4. Cathie Dunn - http://cathiedunn.blogspot.com/2012/01/cathie-amazing-authors-event.html/ - Her question is: What is Rory wearing when Catriona spots him? What is Sloan determined to find? What clan does Tannis belong to? What is the name of beasts of burden on Yden? 9. Jacquie Rogers - http://romancingthewest.blogspot.com/2012/01/jacquies-amazing-author-event.html - Her question is: Where is the Much Ado series set? 10. Karen Nutt - http://kmnbooks.blogspot.com/2012/01/karens-amazing-blog-event.html- Her question is: Who are the Storm Riders trying to save? 11. Anna K. Lanier - http://annakathrynlanier.blogspot.com/2012/01/anna-katherines-amazing-author-event.html - Her question is: What are two of the Four D's? What is the name of the town where the story is set? Who is Odessa trying to find in Phoenix? So, get ready, get set, to...find those answers and email them to me at mizging at gmail dot com, and we hope you've enjoyed our Amazing Author Event! I can't promise you'll win your favorite, but if you want to give me first, second, and third choices, I'll do my best. :) P.S. Anna K asked a great question in comments that I should have added to this post. I'll give everyone a few days to collect the answers and email them to me as described above. Check back here on Friday, in the comments section, for the announcement of the winners. As I decide who gets which book, I'll forward the winning emails on to the individual authors so they can send you their prizes and personal congratulations. Whew....so much to think of with a feeble brain. :) Good Luck. This was such a cute email, I had to share it. I claim no credit for the creativity, although I wish I could. I've been to a few of these places, but not all. I have a sinking feeling, I'm on my way. I have been in many places, but I've never been in Cahoots. Apparently, you can't go alone. You have to be in Cahoots with someone. I've also never been in Cognito. I hear no one recognizes you there. I have, however, been in Sane. They don't have an airport; you have to be driven there. I have made several trips there, thanks to my friends, family and work. I would like to go to Conclusions, but you have to jump, and I'm not too much on physical activity anymore. I have also been in Doubt. That is a sad place to go, and I try not to visit there too often. I've been in Flexible, but only when it was very important to stand firm. Sometimes I'm in Capable, and I go there more often as I'm getting older. One of my favorite places to be is in Suspense! It really gets the adrenalin flowing and pumps up the old heart! At my age I need all the stimuli I can get! I may have been in Continent, and I don't remember what country I was in. It's an age thing. Today is probably one of the many National Mental Health Days throughout the year. You can do your bit by remembering to share this with at least one unstable person. My job is done! Life is too short for negative drama & petty things. So laugh insanely, love truly and forgive quickly! From one unstable person to another... I hope everyone is happy in your head - we're all doing pretty good in mine! A few years ago I entered the book that would become Under A Texas Star in a literary contest. I was prepared for criticism of my characterization, plot, and/or pace. After all, the chief reason I entered the contest was to get feedback I could use to improve my story. I was dumbfounded that the judges’ chief complaint was that it wasn’t believable that a young woman could pass as a young man. Now that Under A Texas Star is published, I feel I can indulge in a little rant on the topic. The dramatic device of a woman masquerading as a man has been around forever. It’s as accepted in historical romance as fast-than-light travel is in science fiction. Let’s set that aside, however. The fact is, women have been successfully posing as men throughout history. I belong to Minerva, a history list devoted to women in the military. Thanks to the academics and enthusiasts, I learned that at least 400 women fought in the American Civil War. They cut their hair, bound their breasts and learn to behave like men. They were only ever discovered if wounded or killed or, as in the case of Sarah Emma Edmonds, they wrote about it afterwards. I’ve picked Sarah Emma Edmonds, aka Frank Thompson, as an example because, like me, she’s Canadian. Edmonds escaped an abusive father in Nova Scotia to live in the United States. When her adopted country went to war, she was determined to serve. Sarah could have been the heroine of her own romance. She served as a “male” nurse in an army hospital, then as a Union spy - disguising herself as a black man, an Irish peddler, and black mammy. In a ploy straight out of Victor-Victoria, she masqueraded as a man masquerading as a woman. Her story includes horse chases, gun play and near escapes - not unlike the adventures of Marly Landers in Under A Texas Star. Unfortunately Sarah contracted malaria and had to desert or be found out. She returned to Canada, fell in love and returned to the States with her husband. They had three sons who, like their mama, served in the US Army. To find out more about Sarah, check out her biography or read the Civil War Women Blog. To find out more about Marly Landers, read Under A Texas Star, available in Kindle, Nook, Kobo, other formats on Smashwords and in paperback on Amazon and Barnes and Noble. Alison grew up surrounded by the great dames of golden age mysteries - Christie, Sayer, Marsh - Georgette Heyer’s historical romances and the classic westerns of Louis L’Amour and Zane Grey. Naturally enough her debut novel, Under A Texas Star, is a mystery-romance set in the old west. My guest today is Ruth Zavitsanos, and she offers some words of wisdom, and a little promotion. Help me welcome her. I’d like to think that as a writer I notice things more than the average individual. I know that in recent years I’ve turned my senses up a notch taking in more than just sights. This definitely helps me to add depth to my writing and allow the reader to go beyond dialogue and action in the story. I’m also aware of the little signs that fall along my path providing inspiration for my writing. Currently, the old farmhouse down the street is being renovated. Now, instead of just walking past this 19th century dilapidated structure with my canine kids, I stop and consider the means of maintaining the old while using the new to upgrade and strengthen the structure. I’ve decided this is the look I want for my cover, since the Sisters Inn is under constant repair. Of course, the hero is doing the repair and one of the proprietors of the Inn is doing her best to ignore the handsome and able handyman. What I find truly amazing about this setting is there are no signs of the modern world, i.e. cars, paved roads, telephone lines, etc. Beyond the farmhouse is the farm, across the street a huge corn field, and next to it, the decaying barn with an occasional turkey vulture perched on an opening that once housed a window pane. It’s as though this setting was hand delivered to me. At times, I can hear my hero and heroine in the distance and see a blur of their faces. These are the times I practically run home to give them their say for others to hear. I’m so grateful to have a setting nearby that brings my characters to life. My first novel, FLIGHT OF LITTLE DOVE, a historical fiction, also takes place in the 1870s. It has received five star reviews and is embraced by women and Young Adult readers. 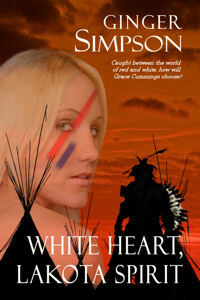 It is available in both print and ebook formats through Whiskey Creek Press, Amazon, and B&N.com. Ruth G. Zavitsanos began writing at the age of 12. Growing up outside of New York City, she attended many Broadway plays and musicals that served to stimulate her imagination. While attaining her Journalism degree at Marshall University she received numerous writing awards. She has been published in Writer’s Digest magazine and had an in-depth article in a regional magazine. Ruth is a member of PennWriters, Society of Children’s Book Writers and Illustrators, Valley Forge Romance Writers Group and Romance Writers of America. Her first novel, FLIGHT OF LITTLE DOVE, a Young Adult read, has been receiving five star reviews and is a book club selection for several independent bookstores. Ruth’s children’s books, THE VILLA DOG,THE OLD FORTRESS DOG, and THE KONA DOG,have been embraced by children, parents and the educational community. Ruth enjoys Pilates, zumba, cooking, reading, music, photography, snorkeling, walks with her canine kids, and travel. She and her family reside halfway between Amish Country and Philadelphia, PA.
My guest today, Meg Mims, touches on what is the hardest yet the best part of writing historical for me...research. Check out what she has to share. Reviews for my first book, Double Crossing, have touched on page-turning chapter endings, rich settings and historical details. Writers might ask how they can find an easy way to do all that in their own books. I have good news and bad news. First the bad—great chapter endings take hard work in the revision process. And the good news? Research is fun. Some writers might argue with me over that, but give me a stack of books or photo-studded websites to trawl, and I’m there with bells on! I love research. More than writing? No, but I can’t explain that wonderful “Aha!” feeling when I stumble over a really great detail I can use for my books. Call me crazy. Call me an old-fashioned library hound. But I can usually make a call on spotting a research detail problem in a book—from a modern phrase to an inaccurate setting or the wrong costume for a character. Why? Because I made those mistakes too. And learned from them. That’s the key, to know better and take the time to do the hard work rather than take the easy way out. Long ago, I entered a contest with the first twenty or so pages of a novel I planned to write. Lucky for me, well-known author Cheryl St. John judged my entry and pointed out very kindly that I hadn’t researched historic Omaha for the time period. How did she know? She lives there, and has extensive knowledge of that history. I scrambled to take her advice and was amazed at how lazy I’d been, making up things when I had plenty of sources that told me otherwise. And that early start eventually became part of Double Crossing! I’m still grateful to Cheryl for her timely tips. And after selling my carefully researched novel, I asked several other published author friends for some nice “blurb” to help promote it and sent them a few chapters. A few tips I can give you about research are: ALWAYS try to verify your source—if you find a detail in more than one place, then it’s bound to be accurate. Key word is try, because sometimes you won’t find more than one. ALWAYS go beyond Wikipedia to find actual historical books on costumes, places, history, etc. My daughter has often told me that she knows people who “fiddle” with Wikipedia and put inaccurate stuff on there. And last, ALWAYS rely on critique partners, friends, family, contest judges, whoever, to catch mistakes. Never assume you are right unless you are certain some detail is set-in-stone accurate. They might be wrong. But chances are good that if more than one person questions something, then so will a reader. And the key is to keep your readers hooked and returning for more of your hard work. So take your time and produce quality. The devil is in the details, after all. To find out more about Meg Mims, you can visit her website or her author's page on Facebook. Click on her picture to get there. Pioneers had in tough in more ways than one...more so the women who didn't often ride in the wagon, but walked alongside or trailed behind. Usually the Conestoga (a large wagon called often called a Prairie Schooner) was filled to the hilt with family belongings and stores enough for a long trip. In order to preserve the energy of the team, whether it be mules, oxen, or horses, anyone old enough to walk didn't do much riding. Grace trudged along behind the wagon, struggling to keep up with her mother. Though the prairie grass grew knee-high in some places, the wheels found the dust hidden below and spiraled the powdery dirt into the air, covering her hair and skin. Her muscles quivered with fatigue. The day stretched on as her father kept the family moving, in search of the right place to stop. The more exhausted she became, the more her thoughts turned to bitterness. Why did they have to leave their home? Was it this stupid thing called gold fever? She didn’t want to live in a wagon. She wanted her own soft bed back… and her own cozy home. The anger she experienced then gripped her again. Grace had just gotten used to being in one place for any length of time. She’d actually found friends her own age and enjoyed their company. Now, surrounded by endless prairie, and glancing at her family, she realized how much she missed her classmates. Tears clouded her eyes. The creaking wagon wheels, plodding hooves, and rustling grasses were the only sounds she heard. Pa guided them toward the distant mountains—the Black Hills, where precious ore supposedly ran in golden veins so thick the brightness rivaled the sunrise. Funny, from where she stood, they looked like any other mountains. Nothing more than granite peaks jutting from a sea of grass and dotted with trees and scrub brush. Mama marched through the weeds ahead, her head held high and her shoulders squared against the growing wind. Where did she get her stamina? She seemed to be faring better than Grace. Her mother’s admirable tenacity and devotion to Papa went without saying. Even when he uprooted the family, Mama never complained. If given the same opportunity, would Grace be such a follower, she wondered? Would she ever get a chance to find out? Suitable husbands didn’t pop up in the middle of nowhere. Being an old maid seemed her fate in life. Her father drove the wagon while Kevin prodded their single cow along and kept her from straying. Grace smiled, thinking of her older brother’s silly jokes. He always seemed to find humor in everything, and even when times got tough, he made her laugh. Recalling a few nights back when he’d donned Mama’s bonnet and danced a jig around the campfire to Papa’s fiddling, caused Grace’s gritty lips to lift in a smile. At twenty, Kevin should have a wife and be making his own plans, but with all the moving around, he hadn’t found a woman to share his life. Did it bother him? If so, he didn’t complain. Lost in thought, Grace missed slamming into the back of the wagon by inches. She swerved out of the way. Her father had stopped the team to check the harnesses. She walked around front and stood next to him. “Papa, when are we going to stop for the night? My legs are tired.” Her words came out in a whine followed by a loud sigh. The tag line for this book gives you a clue where it's heading. "Caught between the world of red and white, how will Grace Cummings choose? Interested? Check it out on my author's page at Amazon. You can even read a larger sample. Hope you'll join in the fun and earn some great reads in a very easy fashion. Also, I have a few great guests lined up for this month, so keep me bookmarked. Western town – or not? From this description, would you think you were reading about the Wild West? The early settlers wasted no time. August Nelson planted cottonwood saplings and Joseph F. Doxford even organized a martial band. A temporary bowery was built. Early in 1865 about 100 more families arrived. In February 1865 the first schoolhouse was built; the first teacher in the school was Hans P. Miller. 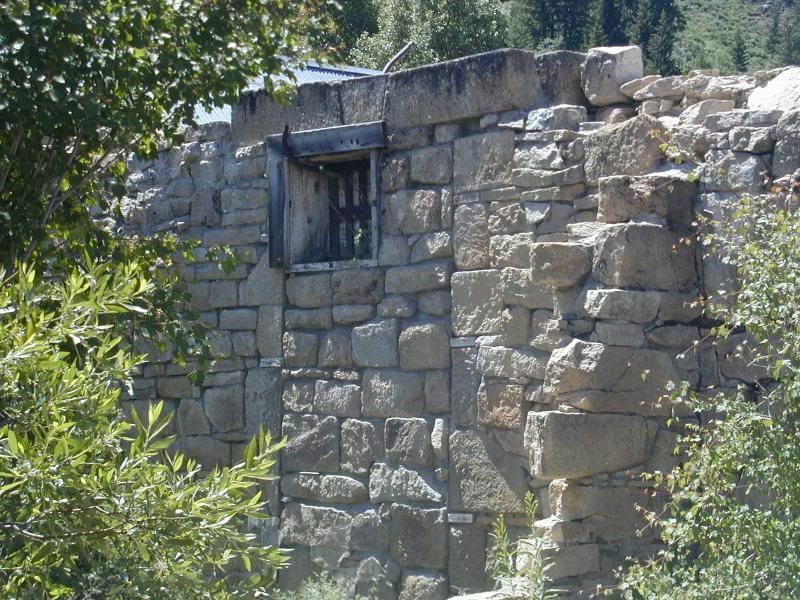 A fort was started in the fall of 1865; each man who owned a city lot was required to build one rod (16.5 feet) of wall. In 1864 Nelson Higgins was selected as temporary president of the settlement. In 1865 Black Hawk and his band of Indians took ninety head of stock, killing two settlers. Other attacks followed. Three settlers, Jens Peter Petersen, his wife Amalia, and Mary Smith were killed by Indians on 21 March 1867; this became a deciding factor in the evacuation of the settlement, which was completed by April. In 1871 many of the former settlers returned and took up their old homesteads. By July 1872 there were 150 families in the area. The town this above article describes even talked about springs and fertile (rich) soil for planting. This town has a dry stretch of plains…even has the cactus and tumbleweed that go along with it. If you were reading a story like this, would you think it was in the Wild West? “How do you feel, Summer? The soft baritone voice rumbling in his chest seemed oddly familiar. Summer frowned and took a second peek at his hair and his mouth. He gave her a full smile. Awareness tugged at her memory and a large knot formed in the pit of her stomach. When recognition came, it struck like a thick piece of wood right between her eyes. She jerked, moving off the comfortable nest she had made of his chest. “Let me go,” she demanded. Although he tried to hold onto her, she managed to slither from the horse. “Of all the confounded foolish female stunts.” He pulled the horse to a halt and dismounted. The moment her feet touched the ground, dizziness overtook her and she plopped down on her bottom. When Jesse reached for her, she slapped at his hands. She glanced at her injury. It was worse than she thought, but she’d die before admitting it to him. She was not riding into town perched on Jesse’s lap for the whole town to see. “It’s just a scratch.” She lifted her skirts, grabbed an edge of her petticoat, and ripped off a piece. It was bad enough that he had to rescue her, but why did he have to look so handsome? This certainly wasn’t the skinny, ill-tempered Jesse Slade she remembered. Well, the ill-tempered part still fit. Jesse stood by the horse, arms folded across his chest as he tapped his foot. Summer brought up the strip of fabric between her free hand and chin and awkwardly fashioned it around her shoulder. Her head pounded worse than ever. She kept on, but the makeshift bandage tore apart. Out the corner of her eye, a self-assured grin stretched across Jesse’s mouth. “Oh!” She stomped her foot, causing another burst of pain in her head. Jesse gave her a grin she’d liked to slap right off his face. She knew he enjoyed every second of her struggle, but she just couldn’t ask the arrogant no-good for help. “’Course, I’d have to touch you,” he said, needling her. Well…I’ll tell you where my story, Heart of a Hero takes place. RICHFIELD, UTAH. No, do not adjust your computer screen, you read correctly. UTAH! Regardless of the location, my story reads like a western… 1880’s. There's a new hero in town . . .
What Summer doesn’t count on in her quest to capture the bandits is the competition from her family’s longtime friend, Jesse Slade. Now a deputy marshal and local hero, Jesse keeps thwarting Summer’s plans, just like he did when she wore pigtails. She would like nothing more than to use Jesse’s head for a slingshot target, but soon Summer finds her aim shifting from his head to his heart. Problem is, Jesse is engaged to her sister Violet. For seven years, little Summer Bennett was the burr under Jesse’s saddle. Now he feels a different irritation as Summer is always on his mind—whether he wants her to be or not. But Summer’s father expects him to marry Violet, and he won’t let him down. So why does Jesse find himself encouraging Summer’s attentions, and why do sparks fly every time they are together? My book is available for Kindle & Nook readers – or at your local store.